The third edition of DocoClub curated by documentary maker Cavell Schipp. DocoClub will be showcasing documentaries by established and upcoming film-makers in the hopes of sharing our enthusiasm for the art of documentary making, as well as to create a space for individuals to share their own work. On this evening we will be showcasing Elephant’s Dream, a story of public sector workers in Kinshasa, in the Democratic Republic of Congo. 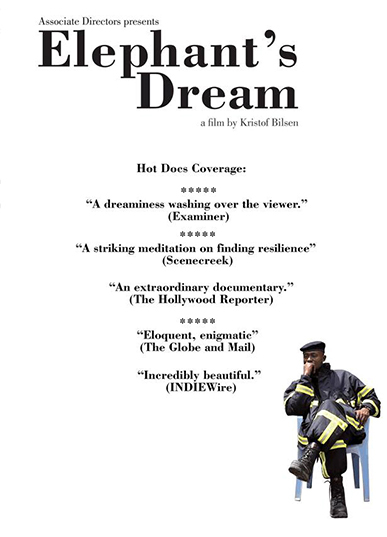 Elephant’s Dream tells the story of a group of public sector workers who live in Kinshasa, the third largest city in Africa, as seen through the microcosm of three state-owned institutions: a rail station, the central post-office, and the only existing fire station in a city of 10 million people. At times surreal, at times hopeful, this film will reveal a truly surprising perspective on lives lived beyond chaos. Kristof Bilsen completed a film-making BA in Brussels (2002). He also works as a cinematographer, editor, and director for the performing arts and collaborated in the past with directors such as Peter Missotten, Sidi Larbi Cherkaoui and Meg Stuart. His first film, Three Women, about female detainees in a Belgian prison, was shortlisted for the Henri Storck Prize and shown twice on Belgian National TV. He enrolled in the Werner Herzog Film Course in Los Angeles and also attended the Berlinale Talent Campus in 2012. Elephant’s Dream is his first feature film and is a co-production with Limerick Films, Associate Directors, Man’s Films, and RTBF, and is currently traveling festivals worldwide. Bilsen is also one of the eight founding members of the Kitchen Sink collective. Above description modified from official press kit.